Fishing is on fire right now! The fishing is at the best it will be all year in our area right now. The conditions are perfect and the fish are pretty much everywhere. Every type of fish that swims in our waters can be caught right now with success. I have mostly fished for Redfish recently, they are all over Estero Bay and when and where you fish for them, as always, is based on the tide. Flats on low, bushes on high is the key to success. Scrap the hunt for pilchards because the pinfish have been producing four to one better than any other. The pinfish are on the flats and willing to show up rather quickly with the right mixture of chum tossed in front of your boat. I believe the longest i fished for bait was twenty minutes this wee, and that’s only because i had an eight hour trip! Daily catches have been reported as high as 30 reds on a four hour trip this week in Estero Bay. I have been averaging 10 to 15 on a 4 hour trip! Thats not fishing that’s catching! If you just want to bend a rod look in the passes and on the beaches, there has been schools of jack as well as Spanish mackerel everywhere. Look for birds and you’ll find them. 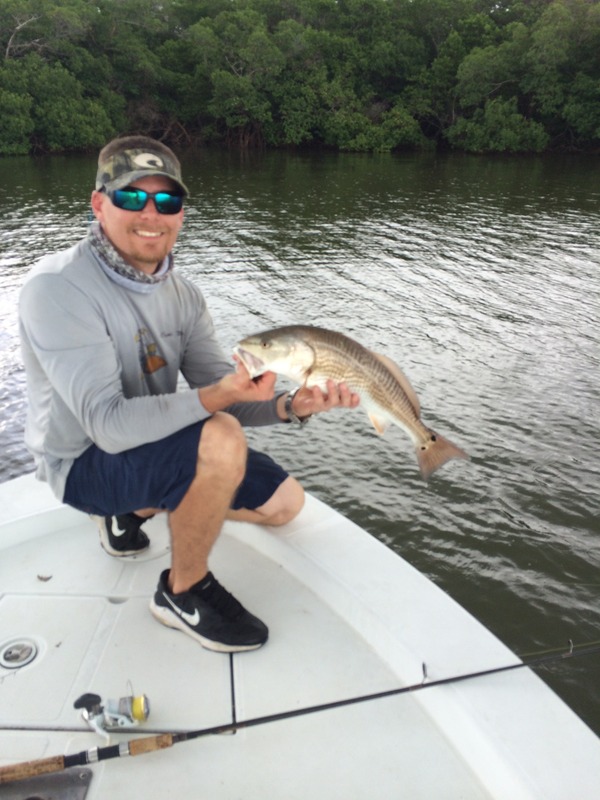 There are sharks offshore, as well as Tarpon, Inshore there is Snook, Trout and Redfish. Look for it to continue to be good in our area through October, or should i say Redtober! If you are a local and thinking of hiring a guide for that once a year trip, this is the best time to do it. Not alot of people out on the water and the fish are everywhere!